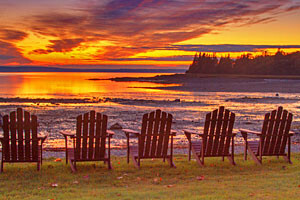 The Mid Coast Region of Maine is comprised of the area between Brunswick and the Down East region of Maine. This coastline is awe-inspiring with rugged, rocky cliffs reaching out to the sea, rolling hills and unique coastal villages that can be found through out the area. This area is a favorite summer vacation destination. For those who have always longed for the sea, the area is rich in the history of shipbuilding and more including great museums, fascinating lighthouses, picturesque parks, inviting coastal shores, and wonderful historic buildings. Located on a very small peninsula along the Mussel Ridge Channel, Birch Point State Park offers stunning views and great picnic areas. Accessible by boat or car, Dodge Point is a great escape from busier areas. Enjoy hiking trails and fishing. A popular destination for sea kayakers, Muscongus Bay isn't really on the way to anything. A great place to hang out for a day. A great park for camping, hiking, biking, and views. A wealthy community calls this lovely island home, but tourists flock here for swimming and sea kayaking. A partially restored house and museum was once home to a Civil War hero.